Karl Barth, God in Action: Theological Addresses (1936; Eugene: Wipf & Stock, 2005), 143 pp. The other day I mentioned the series of Barth reprints published by Wipf & Stock. Here’s another very nice one: God in Action. 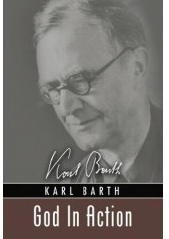 This volume offers several of Barth’s theological addresses, all of them first published as individual pamphlets in the Theologische Existenz Heute series during the early 1930s. The addresses were collected in an attempt to give an overall impression of the emerging shape of Barth’s theological work. Underlying all the addresses is an ecclesiological emphasis: thus there are chapters on revelation, the church, theology as a function of the church, the ministry of the Word of God, and the Christian as witness. The best part of the book is Chapter 2, simply entitled “Theology.” Here, as in the Church Dogmatics, Barth describes theology as “the fairest” of all the sciences, and as the science “closest to human reality” (p. 39). As an academic discipline, theology “is a masterpiece, as well-planned and yet as bizarre as the cathedrals of Cologne and Milan” (p. 39). Yet at the same time, Barth observes: “In no other science is it so easy to be caught in despair, or, what is worse, to end in arrogant overconfidence” (p. 39). No other science “can be so monstrous and so boresome” (p. 40). Barth thus makes the dialectical point that theology is “the freest and yet the most restricted of all the sciences” (p. 40) – the most beautiful and yet the most perilous. Why is it that theology is so often monstrous or boring or conceited? In Barth’s view, the answer is simple: all the “conceited pride” and “monstrosity” and “boresomeness” have their basis in the fact that “theology has not dared to be itself” (p. 43). When it dares to be itself, theology justifies itself: it proves its own possibility and necessity “simply by existing!” (p. 43). And in Barth’s view, theology indeed has a necessary role to perform: “Theology is … a function in the liturgy of the Church” (p. 49). It helps to keep the church faithful to the Word of God, and thus “a Church without an orderly theology must sooner or later become a pagan church” (p. 50). All the addresses collected here have the vivid directness of spoken communication. So if you find the thick rhetoric of the Church Dogmatics daunting or discouraging, this book offers a very direct and very lively way of encountering some of Barth’s major themes.